FOR SALE: The fully spec’d 20th Anniversary press car, book featured and EVO tested, 91k miles. 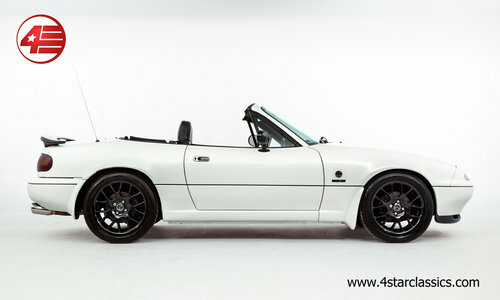 BBR Aniversary Mk1 MX5 build specification: BBR Anniversary turbo conversion (£4,995), BBR stage one clutch (£495), Stainless steel exhaust system (£345), BBR suspension (£795), Limited slip differential (£1,295), Big brake conversion (£545), Mohair hood (£695), Alarm system (£845), Wheels and tyres (£695); Chin spoiler in gloss black, Boot spoiler in gloss black, Door mirrors in gloss black, BBR Turbo build plaques, OMP Superlegero steering wheel trimmed in alcantara, Seatbelt tower brace, Electric windows, Front and rear mud flaps, Remote central locking, Sony CD player with USB, Cup holders, Tailored MX5 carpet mats, Warning triangle, Car cover, Spare key with remote fob. 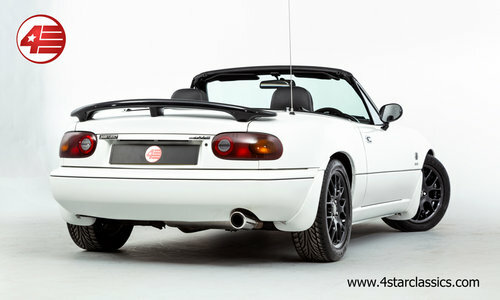 To many Mk1 MX5 enthusiasts this particular car will need no introduction. As BBR’s ‘20th Anniversary’ press car, it has been widely featured in magazines and books alike. After an in-depth review in 2010 Evo Magazine awarded it a 5 star rating, also naming it the most exciting car in that issue. Since then it has received nothing but glowing reviews. Appearing just as it did leaving BBR, the gleaming pearlescent white paintwork looks marvelous against the contrasting wheels and trim. The body remains to an excellent standard all over with no signs of damage or poor repair, and the mohair hood still looks new. Finished in glossy metallic black the door mirrors, front splitter, and boot spoiler really add to the sense of occasion, helping to ensure this rather special Mk1 does not go unnoticed. 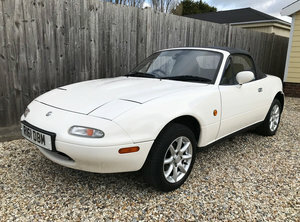 The cabin remains in standard MX5 guise with the exception of an OMP alcantara steering wheel, Sony CD player, and the BBR Turbo build plaque. 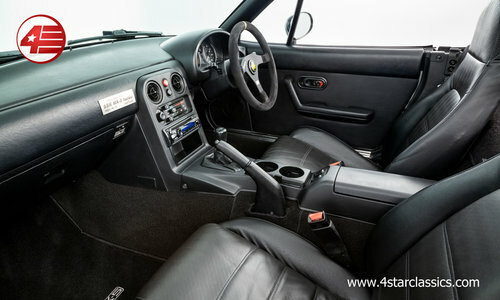 The interior certainly retains a fresh appearance, with the seats having been treated to a full re-trim at BBR back in 2010. The carpets are in fine order too, and are protected in the footwells by a set of tailored overmats. 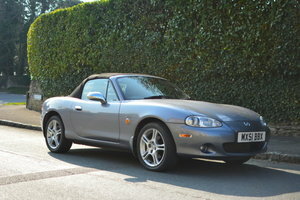 The polished MX5 door sill covers also present well, and at the rear of the car you’ll find a very clean boot area. • Garrett GT25 ball bearing Turbocharger with integral waste gate control, water cooling & ported turbine housing with ceramic coating for improved thermal management. • High temperature alloy cast exhaust manifold with ceramic coating and stainless steel heat shield. • Front mounted air-air intercooler and associated pipe work, powder coated black for factory-style discretion. • Competition standard hoses and fixings throughout. • Auxiliary BBR Interceptor 2010 engine management computer with 3-dimensional mapping and external manifold pressure sensor. • BBR-specification larger fuel injectors. • Stainless steel separated gases exhaust down pipe. • New cool air induction system. • Modified coolant and oil system piping. • Special BBR Turbo identification badges with BBR anniversary plaque. Since leaving the hands of BBR the current owner has made sure the car is serviced annually regardless of mileage. These services were carried out back at BBR and the most recent was done in June 2018 at 91,201 miles. 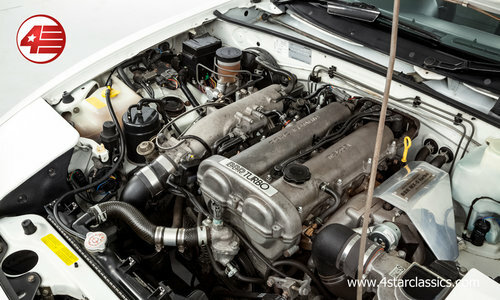 Prior to BBR’s ownership the car was also very well maintained. The larger 16-inch alloys fill the arches perfectly and contrast handsomely against the pearl white body. Pleasingly there are no scrapes or scuffs to the glossy black finish. The wheels are shod in a matching set of Dunlop SP Sport 9000 tyres all with plenty of tread remaining. Uprated brakes were also fitted during the BBR conversion. 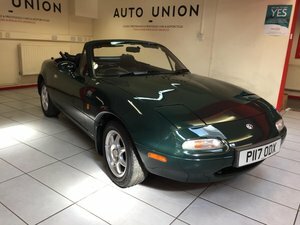 The MX5 was supplied new through Aylesbury Mazda (Lodge Garage) in August 1990. 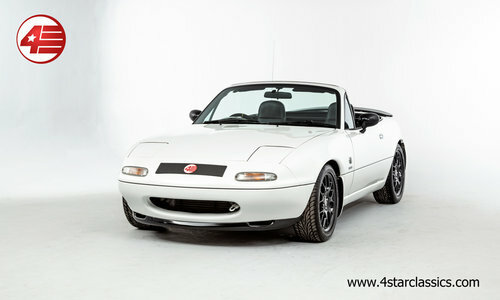 After 20 years of meticulous ownership by a handful of keepers it was purchased by Neil McKay of BBR GTI in August 2010. 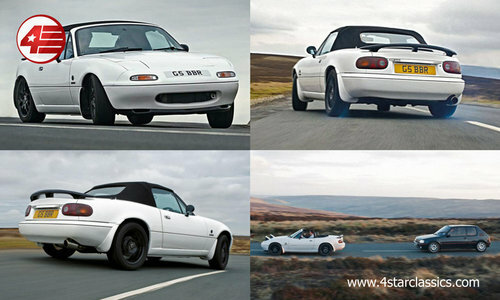 The car was then completely rebuilt to BBR’s exacting standards boasting over £12k worth of options. Following on from the BBR conversion the ‘20th Anniversary Special Edition 001’ went on to become the personal car of Neil McKay, while also promoting the brand and featuring in numerous publications. It was then purchased by the current owner back in September 2015. Despite covering little over 6k miles since that time he has had the car maintained annually at BBR. Services have been carried out at the following mileages: 752, 6k, 11k, 15k, 18k, 24k, 35k, 41k, 47k, 61k, 65k, 75k, 86k, 89k, and most recently at 91k miles in June 2018. The first eleven services were all carried out at main dealers, and the last three were done at BBR. SALE OR RETURN – This option achieves the best possible price for your car and removes the hassle of having to prepare, advertise, arrange viewings and organise payment with potential buyers. You can rest assured that your car will be pampered in our heated indoor showroom and kept in safe hands during the process. OUTRIGHT PURCHASE – This is a quick and easy way to sell your car. The funds will be securely transferred the same day to your designated bank account.